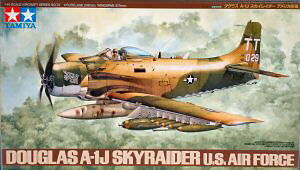 For a brief history of this aircraft and the Tamiya kit in the box, look here. I built one of these Tamiya Skyraiders right after it was released nearly 10 years ago and it was an easy build, but unfortunately the model didn't survive the move so it never made it onto the pages of Cybermodeler Online. I picked up a replacement kit and there it sat for nearly a decade waiting for another opportunity to come together. One of the challenges of producing Cybermodeler Online, working a full-time career, and still taking care of home and family (definitely NOT in that order) is still having some free time left for modeling. This was further complicated by a number of maintenance upgrades I wanted to perform on Cybermodeler Online over the last few years to help the site remain viable well into the future. After a big push over the last year, I finally completed the upgrades to Cybermodeler Online and F-100.org and over the holiday break, it was time to get back onto the bench again. from Aero Research and there were some nice photos of USAF Spads on the ramp in Vietnam. It was a sign - it was time to build the A-1J! Construction starts in the front office and I pulled out the KMC cockpit and compared it to the Tamiya cockpit. As you can see in the image to the right, the KMC pit has more detail and is nicely laid out. By the time I took this image, I had already removed the forward and rear bulkheads out of the KMC cockpit as I had a composite design in mind. 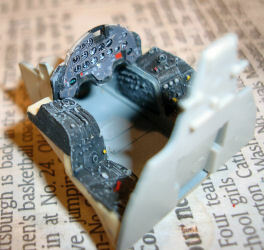 The width of the resin cockpit is identical with the styrene part, so there shouldn't be any lateral clearance problems with the new part. 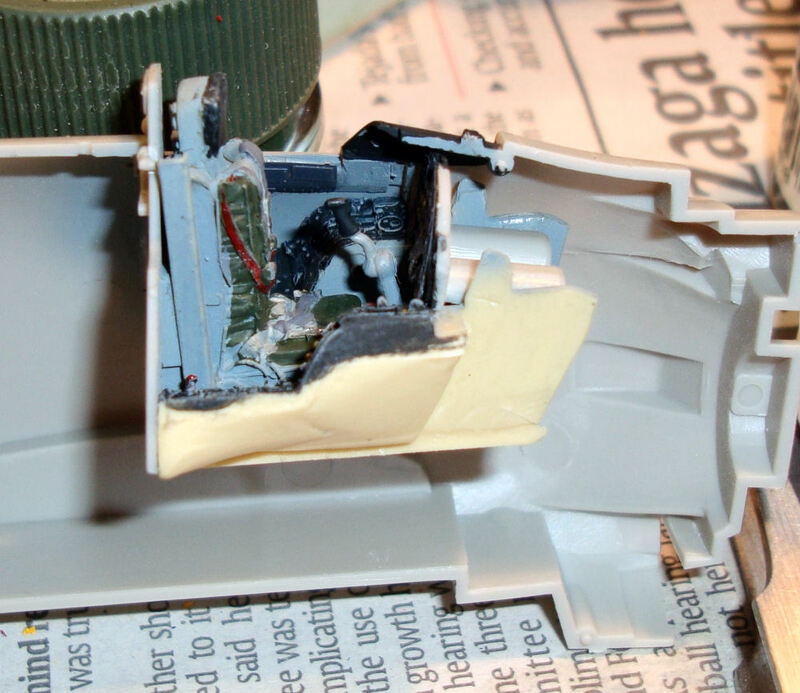 I took the instrument panel/front bulkhead part out of the Tamiya kit and trimmed it to fit onto the KMC resin pit. When I had a good fit, I removed all of the molded-on details from the styrene instrument panel and sanded the surface smooth. This will be the foundation for the Eduard color photo-etched instrument panel. 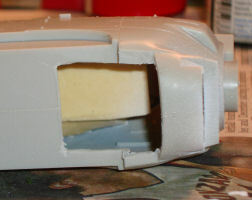 The Tamiya rear bulkhead was also modified to work with the KMC pit, the logic here being that the molded-on alignment tabs on the rear of the bulkhead would make installation of the resin cockpit far easier. With the front and rear bulkheads ready, it was time to put the cockpit together. 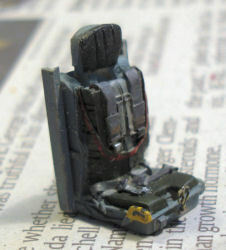 The cockpit was painted according to instructions using a combination of Testors Model Master enamels and Tamiya Acrylics. The Yankee ejection seat in the KMC set is nicely done and has the backpack parachute on the seat along with the strap and harness details. 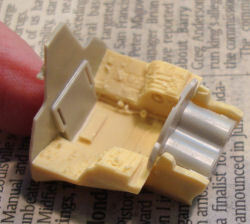 The ejection seat handle came out of the Eduard color photo-etch set. The real star of this show is the color photo-etched instrument panel from Eduard. 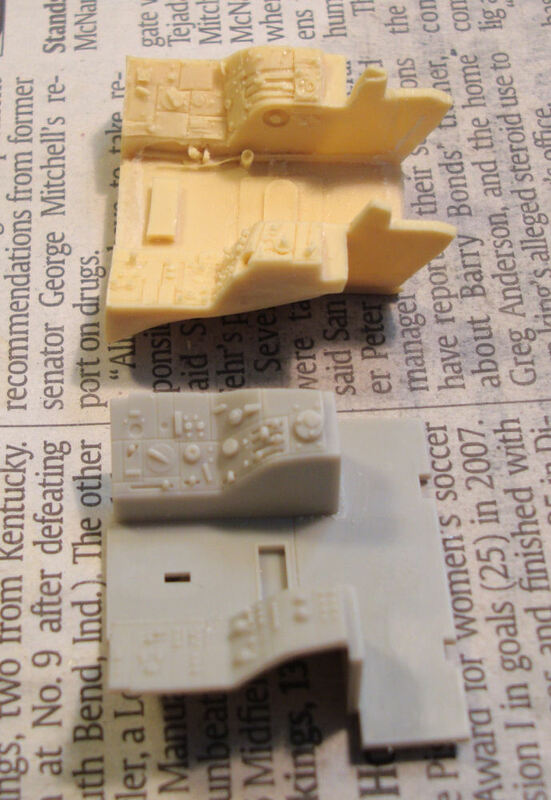 The main panel comes as two layers - the first has the instrument faces printed on it and this was attached to the now-blank styrene surface of the Tamiya instrument panel with cyano. The second layer overlays the instrument faces with bezels and all of the placards. I've had less than good luck overlaying these photo-etched parts in the past as cyano will inevitably ooze out in the wrong places. Eduard has more recently solved this issue with their self-adhesive line that eliminates the glue ooze problems. In a blinding flash of the obvious, the solution was simple - I intended to put drops of Future in each of the bezels to simulate glass anyway, why not simply use Future as the glue too. I painted the surface of the instrument faces layer with Future and pressed the photo-etched overlay into place. Works perfectly! With the cockpit completed, it was time to test my theory of easy installation using the Tamiya front and rear bulkhead parts. I'd dry-fitted the sub-assemblies as I went along through the process and the final cockpit assembly is a drop-in fit with the Tamiya parts. 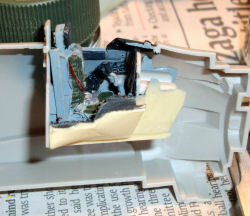 What was especially nice was being able to use liquid cement to attach the cockpit to the left fuselage half and performing the final fit check. With no problem to be found, I installed the tailwheel well and reinforced the installation with cyano where the side consoles meet the fuselage halves. I assembled the wings according to the instructions and added the relevant Eduard detail parts to the main wheel wells. I decided to pre-paint the white inside the wheel wells to make final painting a little easier later on. After looking over the Eduard instructions, I decided to install the oil radiator that sits at the end of the lower air intake scoop under the cowling. The instructions show where to perform this surgery on the fuselage to provide clearance for the radiator on the bottom of the fuselage. The Eduard instructions have you mount the radiator onto the forward portion of the wing center section, but they neglected to have you remove the blanking plate at the end of the lower scoop so you could see the radiator. 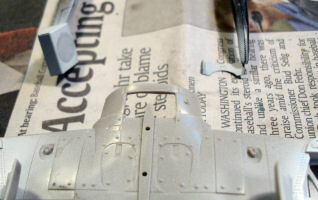 I carefully removed that section from the fuselage and now we'll see the radiator. The wing center section also has a exit flap for the oil radiator molded closed. This was carefully removed so I could replace this with the Eduard flap in a partially open position. You can see in the photos above the new opening on the bottom of the fuselage and the wing center section to accommodate the radiator. The engine nacelle is the next project and this is a fairly simple bit. Your only decisions here are to choose if you want the cooling shutters and cowl flaps open or closed. Both options are provided. The cooling shutters block off intake air over the cylinders so you can make a high-speed descent without cooling shock of cold ram air blowing over the idling engine. The shutters open up again when the power comes back up. 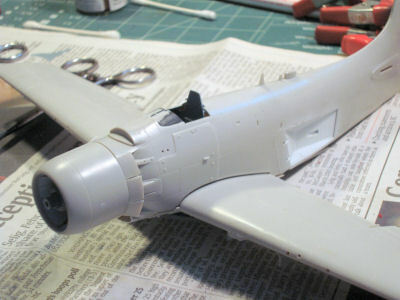 I've seen photos of the shutters open and closed on the ground, mostly open, so that is how I chose to build my Spad. 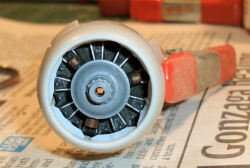 The bulk of the effort was in painting the radial engine and cowling before assembly. I also want the cowl flaps open. With the three major subassemblies together, it was time for another dry fit. You can see in the image below that there is a bit of a gap between the wing and fuselage, even when they are pressed together. What is also interesting is that the one-piece lower wing doesn't have enough dihedral molded into the part. If I glue the wing center section to the fuselage, then mount the airframe into my wing/fuselage jig, those gaps close wing/fuselage gaps close perfectly with the right dihedral added to the wings. Simply glue them up and leave the airframe in the jig to dry - problem solved.